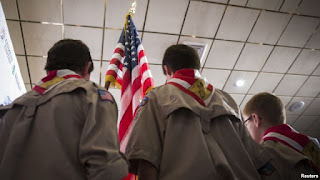 The Boy Scouts of America lifted its outright ban on openly gay adult leaders and employees on Monday, rolling back a policy that has deeply divided the membership of the 105-year-old Texas-based organization. The new policy, which takes effect immediately, comes three years after the organization removed its prohibition on gay youth, but local Boy Scout units chartered by religious organizations will still be permitted to exclude gay adults from serving as den leaders, scoutmasters or camp counselors. The Church of Jesus Christ of Latter-day Saints, the largest of all faith-based Boy Scout sponsors, said in a statement it was "deeply troubled" by the move and said the Mormons' "century-long association with Scouting will need to be examined." The resolution implementing the change was backed by 79 percent of the National Executive Board members voting and present on Monday, the Boy Scouts said. The organization's executive committee had unanimously recommended adoption of the new policy on July 13, citing a "sea change in the law with respect to gay rights." The Boy Scouts' president, former U.S. Defense Secretary Robert Gates, called for change in May, saying continuation of the blanket ban on gay Scout leaders was "unsustainable". He repeated that assertion on Monday, saying any effort to keep the old policy intact "was inevitably going to result in simultaneous legal battles in multiple jurisdictions and at staggering cost." He stressed that religiously chartered Scouting units "may continue to use religious beliefs as a criterion for selecting adult leaders, including matters of sexuality." The Boy Scouts lifted its ban on gay youth in 2013. The selection of Gates as president of the organization last year was seen as an opportunity to revisit the policy on adult leaders since he helped end the "Don't Ask, Don't Tell" policy that barred openly gay people from serving in the U.S. military. The Boy Scouts of America, whose stated mission is to prepare youth for life and leadership, has 2.5 million youth members between the ages of 7 and 21 and about 960,000 volunteers in local units, according to the organization's website. The number of adult volunteers stood at 981,000 last year, down from just over 1 million in 2013, the group said. Zach Wahls, an Eagle Scout and executive director of Scouts for Equality, has labeled the ban a "towering example of explicit, institutional homophobia." "While we still have some reservations about individual units discriminating against gay adults, we couldn't be more excited about the future of Scouting," he said on Monday. He called on those who left Scouting because of its previous policies to "rejoin the fold." John Stemberger, chairman of the Christian youth outdoor program Trail Life USA, said on Friday that lifting the ban would be an affront to Christian morals and will make it "even more challenging for a church to integrate a [Boy Scouts] unit as part of a church's ministry offerings."